← Day 95: Sage Fair. If you asked a kid to try a new ice cream flavour, chances are good that the child might burst into tears. “Why? Is there no more chocolate?” “Did something happen to the strawberry?” “Is the Road no longer Rocky?” Clearly, this would be a tragedy of the highest order. Life can be so cruel! But first, a brief confession: I’m not a huge fan of ice cream. There, I’ve said it. Get over it already! As a cousin of the cheese family, I do acknowledge its inherent dairy fabulousness; however, when push comes to shove, I would take a bag of potato chips over a bowl of ice cream in a heartbeat. Mmmm… salty goodness! I do enjoy gelato, though, and also frozen yogurt, especially to cleanse the palate. This would ideally come in a tangy flavour, like lemon or cassis, for some added zip. But plain old ice cream only needs to be offered in a maximum of three flavours, as far as I’m concerned: Chocolate Chip; its grown-up cousin, Stracciatella (okay, technically, it’s a gelato, but let’s not split hairs); and my all-time favourite, Cinnamon, because, as you may recall, things can never be cinnamony enough. True story! So, when a friend stopped by recently for a little patio soiree, I received her hostess gift of a pint of Ed’s Real Scoop Burnt Marshmallow ice cream (and wine, of course) with mixed emotions. Naturally, I was grateful for the gift, which is always appreciated; but there was a part of me that was slightly apprehensive: Burnt Marshmallow? Really? What kind of flavour is that?!?? The name alone invoked a certain amount of grief. I mean, how many times have you watched a marshmallow that had been lovingly placed on the end of a stick, and hung over a campfire until it had gotten deliciously toasty brown, only to catch on fire and need to be blown out? And then, watched in horror as it slid off of the stick and into the fire before you even had a chance to enjoy it? This is the dark side of camping that your parents never warned you about. So, it was with some trepidation today that I decided to branch out of my ice cream box and finally try this new flavour of ice cream. I scooped a few balls into a bowl and tucked in. Immediately, my tastebuds were transported back to a simpler time when the stars in the sky competed for attention with the kamikaze sparks that would occasionally launch themselves from the campfire. 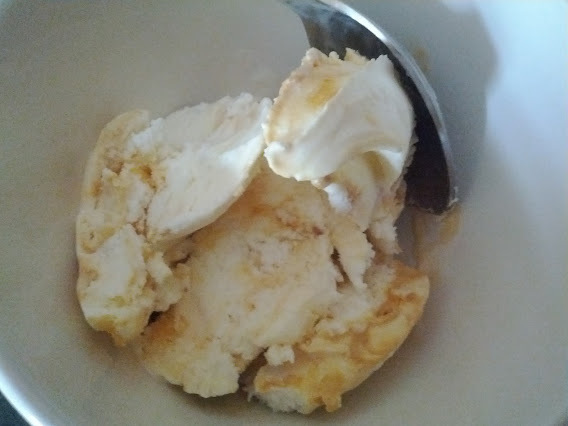 The flavour was rich and creamy, with a deliciously caramel undertone that sent me back for seconds… and thirds, later on, when no one was looking. Yum! Exactly how long had this taste sensation been going on, I began to wonder? And did this mean that I needed to start working my way across the board at Baskin-Robbins? At what point do you leave well enough alone and stick to the tried and true? Clearly, this kind of indecision could use a little support, in the form of another bowl… And, just like that, it happened. The ice cream fairies came and gobbled up the rest of the pint when I wasn’t looking, before they flew away on their tiny, magical unicorns. Coincidentally, it was also time for my hypoglycaemic coma. What were the chances?!! 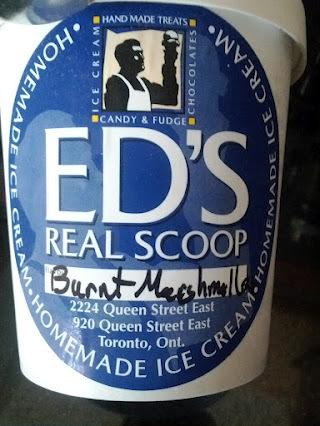 This entry was posted in Food and Drink and tagged Burnt Marshmallow, Drink, Ed's Real Scoop, Food, June, New Ice Cream Flavour, Toronto. Bookmark the permalink.